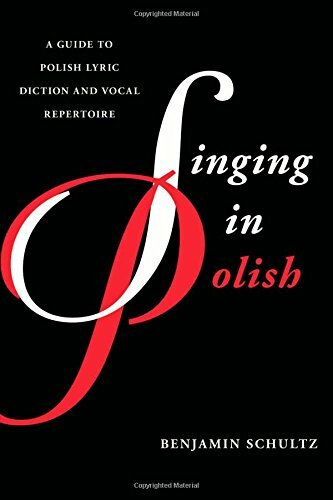 Singing in Polish: A Guide to Polish Lyric Diction and Vocal Repertoire stands as the first book-length resource for non-Polish–speaking singers, voice teachers, and vocal coaches that offers the essential tools for learning how to sing in Polish. Scholar and singer Benjamin Schultz offers a rich repertory of works virtually unknown outside of Poland, providing a unique catalyst for the introduction of Polish vocal music into the English-speaking world of performance. Never before has Polish vocal music been made so accessible to the musical world. With a foreword by Timothy Cheek, the author of Singing in Czech, as well as an overview of the development of Polish music by renowned violinist, Polish music specialist, and scholar Tyrone Greive, Singing in Polish concisely outlines the science and art of Polish lyric diction through the use of the International Phonetic Alphabet (IPA). The included texts of more than 60 art songs and arias from some of the most distinguished Polish composers of all time each feature IPA transcriptions and English translations. Appendixes include lists of key Polish music publishing companies, cultural centers, and Polish poets. Singing in Polish fills a void for singers, voice teachers, and vocal coaches in the Western tradition. It is a invaluable resource for anyone looking to add global variety to vocal performance in the studio, classroom, concert hall, or on the operatic stage.